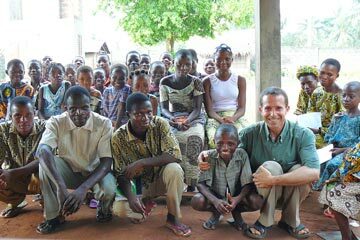 From March 12th to 29th, two brothers were on pilgrimage across Benin, Burkina Faso and Togo, where one of them comes from. Here are some extracts from their daily diary. Our stay in Benin began at the large seminary of St Gall in Ouidah, a historic town known as a departure point for slaves. We had a long conversation with the rector and shared a meal with the seminarians and trainers, which allowed us to talk to a few of them. There are more than 150 seminarians from the second year of philosophy to the last year of theology, before ordination. At Cotonou, the economic capital, we visited young people who had been to Taizé, to discover how they were living and to share the parish life. For the last three years it has become harder for young people from Benin to obtain a visa so as to come and take part in summer meetings at Taizé. We stayed in the centre where are found the diocesan office for work and chaplaincy of young people, just behind the parish church of St Michael, where there is intense activity. We prayed with twenty or so youth leaders, belonging to various groups from across the town – exams had prevented others from coming. They pray together regularly and also meet up to organise events which are requested of them across the diocese. After Cotonou, our next stop in Benin was at Gbozounme. Here, the men and young people often work in the town and come back at weekends. On Sunday morning the 6 o’clock Mass is full of elderly men, women and children. Everything happens in the local language, Gon – marvellous rhythms sung with a whole troup of tiny children sitting on mats to the right of the altar. In the afternoon, we will have time to sing together. Straight away, at the end of Mass, the priest jumps on his motorbike to get to the next service in a series of communities, whilst the people form up around the church in little groups, to meet each other, to have instruction, and, for some, to prepare for baptism. 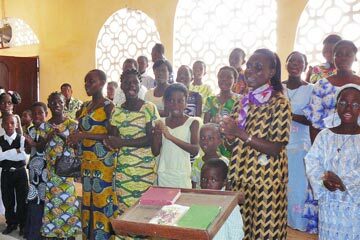 At Parakou – 330 km north of Cotonou, in the centre of the country – a young priest who came to Taizé a few years ago has become the Diocesan Youth Chaplain. We prayed and talked about the Nairobi meeting with a whole team of young leaders from various groups and parishes in the diocese. In Burkina Faso, the “country of upright men”, we were welcomed at the Lavigerie Seminary of the White Fathers at Ouagadougou. From the first evening, we were able to meet with the thirty young “interns” from various countries, who are preparing to serve as missionaries: during the day, up to a hundred of them are in training. Early in the morning, we leave for Dori, 250 km to the north. On the way we are surprised by the village of Bani with its numerous mosques and a conical minaret. We arrive at Dori on market day: the “taxis” on donkey back indicate the rhythm of life. The parish comprises close to a thousand faithful. Almost all the thousand parishioners are “passing through”: most of them are civil servants who have been posted to Dori for two or three years in this region that is traditionally Peuhl, and therefore Muslim. We were able to visit three families of young people who came to Taizé last year. Father Juvénot, a Congolese priest who himself stayed at Taizé during his training, made this conversation possible – the great simplicity of the sharing touched us greatly since their living conditions are not easy. In the evening, in the parish, we met for a time of prayer with a few young people who meet together regularly – with plenty of challenges to living their faith in this setting. The question returned: how to live more and more of Christ? After two days at Dori, we took to the road again towards Ouagadougou. On the way back, at midday it was over 42º C in the shade and numerous women, with children on their backs, were walking along the road with their tools to get to places where they know the earth contains gold dust. Not far from there, the multi-national mining companies do the same thing: open casting on a much bigger scale. From Ouaga where we had spent the night, we left early in the morning for our next stopping place which would be in Togo. There is not a bus every day, so we had to take a bus that goes only to the Burkina-Togo frontier, then find another means of transport to get to a priest who was waiting for us in Kara. The first Home of Charity in Africa is at Aledjo, where a priest friend, and a young person who came to Taizé in 2008, live in a tiny youth centre which is still in construction. Seven young people live in tiny round cabins. They have just cleared part of the fields and are building a hen house. In the evening a few youths and children from the parish welcomed us for a prayer together. At Atakpamé, the church has passed through so many trials that it was lovely to meet up again with a young bishop: a musician and guitarist …who, after one year of service is full of gratitude for the present and of hope and trust for the future. On the Saturday, we were back at Lomé, in the parish of Notre Dame under the cross of Agbalépédogan. We were joint animators for a parish day of recollection: some 400 people of all ages came together for a morning prayer followed by a bible introduction in French and in Ewé about the love of God for us and our freedom; a bible text and the Letter from Kenya served as the starting point for reflection on the interior life and our involvements with and for other people. A very committed young man witnessed to his life as a thief before having a “meeting with Christ that bowled him over”. During the feedback of what had been shared in small groups, a child spoke so simply of the way of forgiveness that those listening gave spontaneous applause. The Way of the Cross went round the neighbourhood before coming back into the area around the church – the people smiling and freely kneeling, even on the dusty ground: these were real reminders of a way that follows Christ. At the closing Mass joy shone on faces, gratitude for living a perceptibly strong time of communion. On the Sunday we were again at a children’s Mass in another parish: the children gave their all to the songs and at the end of the service we learned that they belonged to the aptly named choir – “the Friends of Jesus Children”!